Apples are relatively high in dietary fiber. For someone dealing with constipation as a result of irritable bowel syndrome, or IBS, eating them can often prove beneficial. Dietary fiber can help soften stool, making it much easier to pass. Other IBS sufferers, however, may not enjoy the same results. Apples — and other raw fruits, for that matter — can trigger or even worsen IBS symptoms from the increase in intestinal gas. 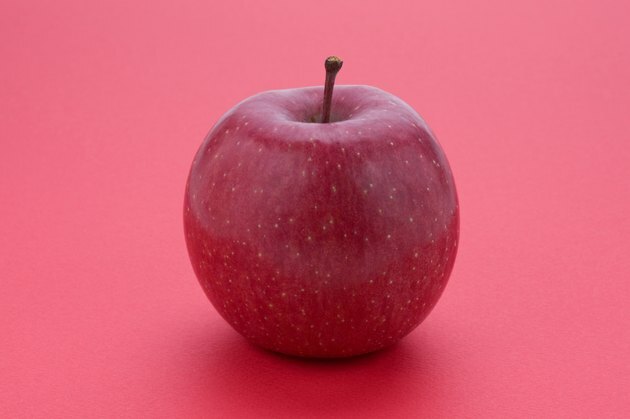 The dietary fiber in apples — and other fruits, vegetables and whole grains — tends to pass through the stomach and small intestine relatively intact. It isn't until fiber reaches the large intestine that it begins to break down, but this breakdown isn't the result of acids and enzymes. Instead, bacteria facilitate the process, producing the byproducts of hydrogen, carbon dioxide and, sometimes, methane. Combined, the three are otherwise known as intestinal gas. Along with this gas, you may also begin to experience some bloating as well as other symptoms associated with IBS, such as abdominal pain, cramping and diarrhea. Like any digestive condition, the symptoms can range in severity from mild to severe. In fact, IBS sufferers with more sensitive nerves can experience a great deal of discomfort when adding fiber to the diet, warns the National Institute of Diabetes and Digestive and Kidney Diseases. Treating gas and bloating often involves self-care measures. Your safest bet is to eliminate your triggers. If apples are problematic, cut them from your diet, at least for the short-term. You may also improve your symptoms by eating smaller meals, drinking plenty of fluids and exercising regularly. After cutting apples and other foods high in fiber, start incorporating them back into your diet. Start slowly, increasing your intake week by week. This method may help you find a good level of fiber intake that won't exacerbate IBS symptoms. If self-care fails to improve IBS, or the gas and bloating associated with the condition, talk to a doctor or dietitian. Medical professionals can establish the most appropriate diet for you based on your health, weight and symptoms. Your doctor may also recommend taking a medication to improve symptoms. Anti-diarrheal medication can prove beneficial for some people, where as others may require anticholinergics, which can relieve muscle spasms by altering the autonomic nervous system. You may also see an improvement with antibiotics or nerve receptor antagonists.